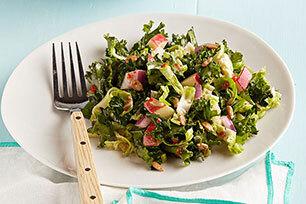 Kale combined with Brussels sprouts makes a delicious salad. Add apples and sunflower kernels for extra crunch. Finish off the kale salad with a dressing of Italian dressing, mustard and honey. Cut stems off Brussels sprouts; discard. Cut sprouts lengthwise in half, then crosswise into thin strips; place in large bowl. Shred kale. Add to Brussels sprouts along with apples, onions and sunflower kernels; mix lightly. Whisk remaining ingredients until blended. Add to kale mixture; toss to evenly coat. Cook sunflower kernels in small skillet on medium heat 1 to 2 min. or until fragrant and golden brown, stirring frequently. Watch closely as they can easily burn. Made with a variety of foods, this colourful salad can fit into a healthy eating plan. And as a bonus, the kale provides an excellent source of vitamin A.